If you’re involved in a merger, some of your best people in the acquired company are job hunting. Count on it. Maybe you don’t have many who are circulating their resumes yet, but you can bet the majority are considering their options. Mergers are good at getting people’s attention. Everybody wakes up, looks around, and wonders how his or her career will be affected. Some people can’t stand all the uncertainty and ambiguity, so they start looking for opportunities somewhere else. Others have a pretty good idea of what’s coming, but don’t like the looks of what they see. So they, too, decide to check out other job possibilities. The most talented people, of course, typically have the best alternatives. 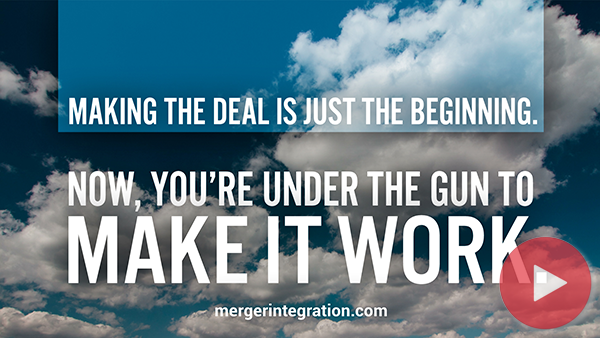 Executive recruiters aggressively seek them out, knowing that mergers always loosen the ties that bind. Research shows that acquired firms, on the average, lose four out of ten managers during the first twenty-four months of a merger. This turnover rate is three times the rate found in companies that aren’t involved in a merger. In hostile takeovers, the turnover rate among managers jumps above 50 percent. Nobody tracks the turnover statistics on other important personnel such as key technical talent, the best sales people, and so on, but there’s no reason to believe their data would look very different. Often, of course, people are the most precious part of the deal. If the top talent leaves, the value of the acquisition drops through the floor. That’s bad enough. But what makes the problem even worse is that those who depart frequently join up with and strengthen your competitors. You might as well operate from the premise that everybody is considering other employment. With that as your mental framework, take a closer look at the situation. Who will be most crucial to the success of the merger? Who can you not afford to lose? Figure this out in a hurry, and engineer a re-recruitment effort that helps you hang onto these folks. Make it resemble a full court press. What should re-recruitment look like? Well, it should be a lot like basic recruitment, but even better. After all, you’ve got more invested in these people than you would in a newcomer. 1. Make the target person feel special, not taken for granted. 2. Keep the communication lines open and active. 3. Take the person into your confidence, asking for his or her ideas and opinions. 4. Try to give the individual a key role, a special assignment that makes it clear that he or she is a highly valued individual. 5. Consider giving a raise, a higher-ranking title, or a “stay” bonus. Above all, don’t assume people are planning to stick with you just because they’re not talking about leaving. Most folks don’t announce their intentions in a public fashion. In fact, if you don’t start re-recruiting until a person seems visibly troubled or talks openly about leaving, you’ve probably waited too long. Chances are your high-talent employee, though still on your payroll, has already moved in emotionally to a new job. The heart always leaves before the body. Finally, you need to know that turnover peaks at two times in the typical merger scenario. 1. The first vulnerable point is early on—during the first several weeks—when the integration process is just getting under way. This suggests you need to attack the situation immediately. 2. The second exodus occurs some months later, as the new organization finally takes shape and people get an accurate sense of what it’s going to be like to work in the merged organization. At this point the wait-and-see period is over. Now comes the second turnover surge, as some of the people who were patient enough to “give it a shot” decide the merger hasn’t worked in their best interests. This crew is harder to re-recruit. The secret lies in starting early and being willing to invest as much time and effort as you would have to spend in attracting replacement personnel.